Here is an observation suggestion for next winter. Marko Mikkilä photographed possible new arcs during winter 2007-2008 ( 1 ). Source elevation was -1.5°. Different processing shows them as not only 22° arcs but also new helic arcs. Some twinned crystals allow creating both similar arcs and Moilanen arc so these arcs could be spurious arcs from Moilanen crystals. Such twinned crystals are present in small amount in samples from Moilanen display. I have put the best images in the main picture. The crystals seem to be two twinned plates with a glue area in between them. Even few of these crystals could give significant Moilanen arc as the ray path is extremely efficient, even more efficient than parhelia ray path (for a plate crystal, rays go mostly in the helion, then in the left/right parhelia/subparhelia and parhelic/subparhelic circle while almost all the rays entering such twinned crystal go in the Moilanen arc (not in the helion)). The 22° arcs would be from rays entering and leaving the small upper tilted prism faces (with total internal reflections in between). The helic arc is mostly from total internal reflection on the small upper prism face. Some reasons also tend to show that the actual fall orientation of such crystal is with the prism pointing up (and not pointing down like it was thought before). If this is true, we can deduce that best configuration to see these arcs again is with source elevation around -10°. 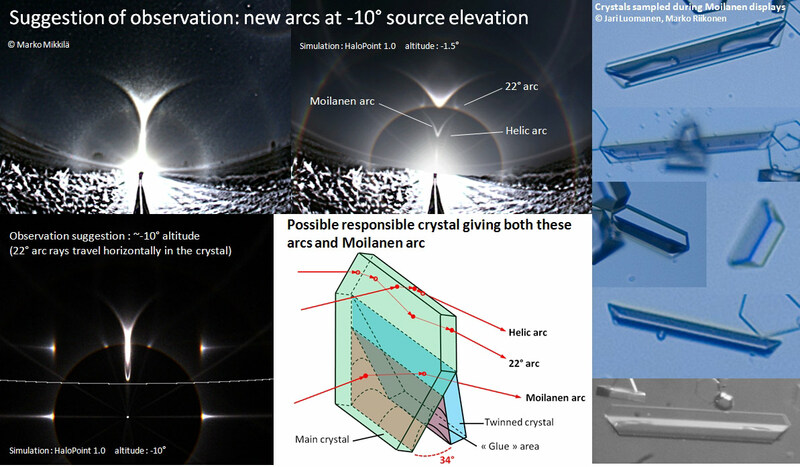 In this case, 22° arcs rays travel horizontally inside the crystal and so are more likely to exit (as the main habit of the crystals seems to be long needles), helic arcs should also be stronger, and tangent arc is narrow (so well separated from these arcs). However Moilanen arc should be difficult to distinguish from subsun and divergent light pillar. For similar lower arcs, the best configuration would be source elevation around 10°. However lower arcs are less likely because of the “glue area” messing with the basal faces for total internal reflection. It would be really interesting for people who have the opportunity to try to get other observation of these arcs next winter. They should be most visible at source elevation around -10° and vanish quickly for positive source elevation. If these arcs are spurious arcs from Moilanen crystals, it would definitely help finding the responsible crystals. Nice work Nicolas. That explanation could work if used orientation is plausible and those crystals really are like that.